Going natural is always a better way to deal with everything in life, everything that comes synthetic always comes with a sort of side effects we don’t want to deal with. 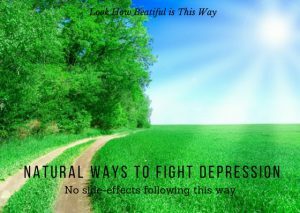 And for those of you who suffer from depression, there are several natural ways to fight depression you should consider before taking the synthetic way. For the sake of keeping things simple let’s say that depression is a serious condition in which your mind and body are out of balance, and what you need to do is to balance your state again. A very important thing to always take in consideration is that depression it isn’t a disease perse, as soon as you make a distinction of treating it like an illness you’ll start to considerate taking some drugs to get healthy again, which many will tell you is not a rainbow way full with candies and ponies. Cortisol is produced as a result of your body responding to stress, getting a massage will lower your cortisol levels to half. It also will increase your serotonin and dopamine levels which helps you to stabilize your emotions by making you more relaxed. A psychological positive effect of a massage therapy is that makes you remember that you deserve to be happy and feel good in your own skin. According to some studies, deficiency of vitamin D is correlated with depression. And according to a lot of studies a high-dose of vitamin D, helps to decrease some symptoms of depression. Thank God vitamin D is safe in high-doses because is recommended that persons suffering from depression to maintain vitamin D above normal levels. More research is needed to understand how vitamin D exactly work to help cure the symptoms of depression but what experts know is that those with suicidal thoughts that have depression, almost immediately got better from that symptom when the vitamin D was at higher levels in the blood. By the way, the Sun is a great source of vitamin D.
Probably the best natural drug you can take (produce better said) is doing exercise. A lot of chemicals are being released in the brain when your doing some kind of physical activity, like serotonin which helps you improve your mood, health and well being. A monumental quantity of studies has shown that exercise promotes mental health and make depression lower its intensity. I believe that a psychological factor to this is that you’re taking care of yourself which makes your self-esteem goes up by making the effort of sweating and working out. To be honest, I personally don’t know how effective is this wort, (so I cannot be sure 100% to recommend it). But some studies suggest that it’s more powerful than many antidepressants without the side-effects. If you want to see a more immediate result of improvement with less risk then you may try consuming St John’s wort. You may find it in supermarkets and health food shops as liquid form or tablets. Natural is better because helps you avoid the side effects of unnatural ways. While there are many natural ways to fight depression, you don’t need to get overwhelmed and use them all at once, but yet you need to develop a plan to start using at least one for a week and then implement another one in the next week, checking always how’s your mood and how well you’re improving.